Kodak has announced a new All-in-One printer called Kodak ESP Office 6150. This new printer has wireless connectivity and print speeds up to 32 pages per minute. 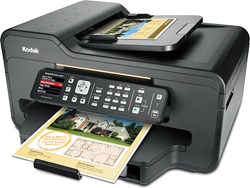 The Kodak ESP Office 6150 All-in-One printer will be available on the marked in April 2010 and cost about $230. Rochester, NY, January 6, 2010 — Eastman Kodak Company (NYSE:EK) today announced an extension of its innovative All-in-One (AiO) Inkjet Printer portfolio for the Home Office business market with the launch of the KODAK ESP Office 6150 AiO Printer. This new Kodak Printer offers home businesses improved productivity with four-in-one flexibility and premium-quality printing with the lowest total ink replacement cost in the industry1. The ESP Office 6150 saves consumers on average $110 per year on ink based on as few as four pages per day2, delivering the quality their business deserves without straining their bottom line. Saving money on ink doesn’t mean compromising on quality. Kodak AiO Printers use proprietary nano-particulate pigment inks instead of dye-based ink to provide premium quality and industry-leading image stability. This means home business owners can print crisp text documents, brilliant graphics and Kodak Lab Quality photos4 that will last a lifetime.5 Kodak prints also dry instantly, so documents and photos are ready to be shared right away. * Fast, efficient faxing at 33.6 kbps with 30-page document feeder. In addition to the launch of the ESP Office 6150, Kodak also announced an enhanced ink replacement offering which provides greater convenience for consumers who print more frequently. Kodak’s new ink replacement offerings include a new Kodak Black Ink Cartridge 10XL and improved Kodak Color Ink Cartridge 10C to enable consumers to print more with added convenience and less trips to the store for replacement ink cartridges. To learn more, visit the newly redesigned http://www.kodak.com and follow our blogs and more at http://www.kodak.com/go/followus .